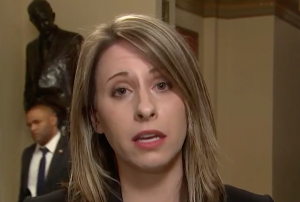 California Rep. Katie Hill (D.) called for a hard line against President Donald Trump’s proposed wall Thursday, saying the shutdown is his "political terrorism." Hill, the third-youngest member of Congress, argued federal workers were going through extreme pain on account of the government shutdown, which will cause most workers to miss their first paycheck tomorrow. She blamed Trump squarely for this "tragedy" during an appearance on MSNBC. "It really is a tragedy. This to me—I know it's a strong word but this is political terrorism," she said. "Congresswoman, I was excited for you being a congresswoman and being in Congress," host Ali Velshi replied, as the interview came to a close. "One day we'll be able to get down to the business of government." Hill also chastised Trump during the interview for using "pretend facts" about California’s wildfires to justify reducing federal funding for emergency services. And she said the border is not a crisis except for the "true humanitarian crisis for the people trying to come here." "It gets more and more frustrating every single day to see how irrational he is," she said of Trump. "We can't accept this anymore. We have to hold the line." She compared the president to a small child and said politicians should never negotiate "on the backs" of federal workers. "This is like a toddler having a tantrum," Hill said. "This is unacceptable moving forward. Negotiate with us, but not on the backs of people who again have nothing to do with it."